This is the tiniest wildflower I have ever tried to look at so I've included a picture of an umbel of these flowers with a €10 note to give some idea of the scale. 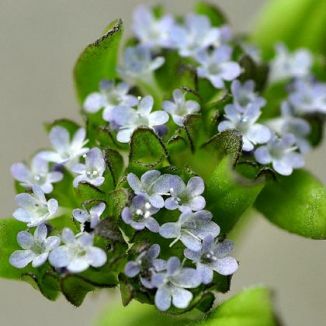 These five-lobed flowers (1–1.5 mm across) are pale lilac blue and are held in dense, flat-topped, terminal clusters on ridged, hairy stalks from April to August. 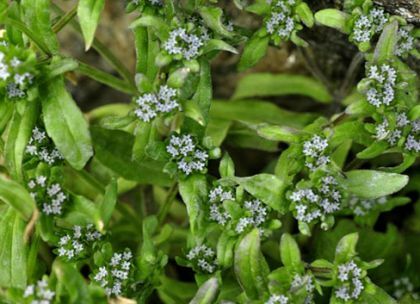 An annual plant, Keeled-fruited Cornsalad is bushy and grows to about 30 cm high, with oblong leaves on the upper stalks and spoon-shaped leaves lower towards the base of the plant. It grows on pathways, in angles between pavements and old walls, and by railways. There are other varieties of Cornsalad and identification is only made by the seed shapes. This plant belongs to the Valerianaceaefamily. I found this plant in Dalkey, Co Dublin in 2005 and photographed it there in 2009. Also known as Lamb's Lettuce, this plant was introduced into the kitchen garden by Louis XIV's gardener, having previously been a crop used by the peasant class. It can be found in European markets in spring when the taste is at its most mild. The name Lamb's Lettuce is thought to be a reference to the fact that it tastes best during the lambing season. It is highly nutritious, containing vitamins C, E and B9 and also beta carotene.